Mark played football and wrestled while attending Palo Verde High School in Tucson (1964-68), making the All-City football team during his junior-senior years. As a senior, he compiled a 10-1 wrestling record and played in the All-Star football game in Flagstaff. 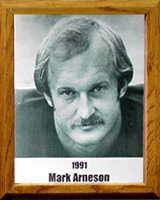 Mark went on to play football at the University of Arizona while earning a degree in business. He was team captain and All-Conference (1973-74), named to the first team All-American by Time Magazine and Sporting News and played in the Senior Bowl, East-West All-Star Game and the College All-Star Game (vs. Dallas Cowboys). Mark enjoyed nine outstanding seasons as a linebacker with the St. Louis Cardinals, starting every year and playing in 104 consecutive games. He was named Rookie of the Year in 1972 and holds the Cardinals’ record for most recovered fumbles (18). He was Defensive Player of the Game in the 1974 playoff game against the Minnesota Vikings. The Cardinals won the conference title that year and in 1975. Mark, who received the Paul Christman Memorial Award for athletic and community achievement in 1980, is vice president and a member of the board of directors of the Fellowship of Christian Athletes, a group in which he has been active since his early years at the University of Arizona.